Now in his mid-50s, countercultural and free-spirited as ever, the popular ex-Major League southpaw continues to zip curveballs over the plate and at the establishment in this sequel to The Wrong Stuff (1984). One reason 20 years have elapsed between the two books may be that Lee robustly and publicly enjoys his recreational intoxicants; another may be that he has kept very busy playing baseball outside show purviews. Lee has always been an outspoken, unconventional character who irked managers and front offices alike. (Both blackballed him from time to time.) In the mid-1980s, after 13 years in the limelight with the Boston Red Sox and the Montreal Expos, he found himself looking for rubbers from which to pitch. He found plenty who were eager to tap his profane and exuberant personality, from the senior circuit and the exhibition leagues to colleges and clinics for Mic-Mac Indians in his adopted Canada. Lee is supreme at conveying the pure joy of playing baseball, and he also captures the fun of his run for president of the United States as the Rhinoceros Party candidate (he gets Abbie Hoffman’s endorsement, but not Hunter Thompson’s), of learning how to drink cognac from Bobby Hull, of playing in the 1988 Goodwill Games in the Soviet Union, of hitting a home run while playing for a semi-pro team in Saskatchewan that instantaneously coincided with a shatter of lightning and the coming of rain to quell an ruinous drought. 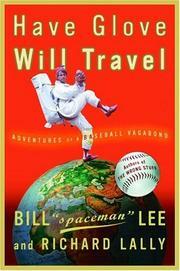 He’s entertainingly all over the field: going to Cuba and tendering a savvy piece of travel writing, discussing Bernoulli’s principle and the physics of the curveball with Ted Williams, explaining the dynamics that involved pitching into trade winds rather than prevailing westerlies, sending up a lovely tribute to his father and his children, or taking the Major League to task for its greed and glitz. The Red Sox just delivered the World Series, but Lee delivers the beauty of elemental baseball: two pleasures the sport sorely needed.